You are here: Home / au pair gifts / How Much Do You Spend on Holiday Gifts for Your Charges and Their Parents? 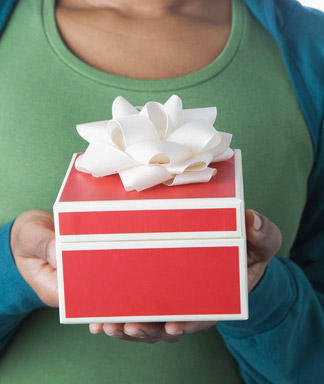 How Much Do You Spend on Holiday Gifts for Your Charges and Their Parents? We started of this week with our suggestions of what to give as gifts to the family you work for in our 2011 Be the Best Nanny Newsletter Holiday Gift-Giving Guide. Today we share the results of a holiday gift-giving survey on how much nannies and au pairs spend on gifts for their employer’s family. Of the nannies that took our Be the Best Nanny Newsletter holiday gift-giving survey, 59% give a holiday gift to each member of their employers’ family (both children and parents). Although it is completely appropriate for nannies to give one gift to the entire family rather than individual gifts, only 3% of survey participants give one gift to the entire family. Whether you give gifts only to your charges, to both your charges and their parents, or just one gift for the entire family, the most important thing to remember when buying holiday gifts this season is that it is fine to keep to a budget. Consider that the sentiment and meaning of the gift is much more important than the price tag. How much do you spend on gifts for the family you work for? 44% No more than $75. 31% No more than $50. 6% I have no budget, I just but what I think they will love. Honestly I just try to stay under $50. It's really hard to find gifts for under $30. I give to both parents and kids which is expensive since they only buy me one gift. But, they do so much for me and I'm thankful for my job. I did find the toddler a great gift for just $11 so I did stay way under budget for that child. I can't imagine not buying the parents a little gift too so I just give them a gift certificate each year for free babysitting. But I buy each kid something they really like, no matter how expensive it is. This year about 440 each kid. My budget for all of the family is about $100. So I usually am creative. This year took your idea or you took mine of children's books with matching pjs. The matching pjs work for the parents also. Think they should all wear them Christmas morning, will look cute in photos. How much do you spend on gifts?Sharon: I try not to spend no more than $30 per child, considering I nanny 5 from one family that's pretty good going!Tiffaney:I don't, I usually make my gift. I'm kinda crafty in this subject. I always have the kids help me with their parents gift. I do most the planning and prep work from home. Sarah:$‎20-$30 per child and home-made or under $20 for parents.Melanie:I spent $20 on child, $20 on parents and then we made a scrapbook w/ artwork and pictures from the first day I started my job(in April), they are going to LOVE it!Eva: ‎20.. whatever I think of for the parents that's not TOTALLY cheesy, that cost doesn't matterShelby:I have been buying things here and there for months now that I've been saving for xmas presents for the baby I nanny for. I've already spent too much im sure, but I'm working on one more thing. Then im done! Her parents are extremely generous to me, and how fun is it to buy baby stuff?! So I don't mind at all : )Karen:I generally try to give something homemade for the kids if I can. They usually have so much anyway they are hard to buy for. Sometimes I don't give the parents anything and sometimes I will give them a gift certificate for a free night of babysitting from me.